Surrounded by the Sierra Madre Mountains, Puerto Vallarta is located along the Pacific Coast in the heart of Banderas Bay. This region of Mexico offers a myriad of culture, traditions and natural beauty of the people and the land. This beautiful place makes your vacation an unforgettable experience and compels you to explore more. Wondering what to do in Puerto Vallarta during the upcoming visit? Traveling on vacation to a new city means a whole new world awaits to be discovered. From undiscovered history to the beauty of the land and the people you meet along the way, an unforgettable escapade is in store while taking Puerto Vallarta yacht tours. The below enlisted five adventures will make your visit so special in the enchanted city of Puerto Vallarta. ADVENTURE ON BANDERAS BAY – As you sail on the turquoise blue waters, discover its secret hideaways while surveying the lesser traveled Pacific Coast of Mexico. During your sail, you can look for dolphins and the sunrise behind the Sierra Madres while keeping an eye out for whales too. Pass through the beautiful Los Archos National Marine Park, and the gorgeous granite rock formations protruding out of the water are sure to be captivating. Do try snorkeling in this protected zone as it is home to many sea creatures and other marine life. Don’t miss a day excursion to Majahuitas Cove – an ideal place to stop for a snorkel and swim. DAY EXCURSION TRIP TO YELAPA – This remote fishing village is most easily accessible by boat and is the perfect place to set up your hammock for the day, parasail, hike into the village, and swim in a waterfall. The locals are very friendly. The beaches are full of golden sands and the sound of the waves, when they hit the shore, is awe inspiring. As you hike through the village, you can find Javier’s Rosewood Artisans. They create handmade items carved from the locally grown rosewood. The villagers are very friendly and will surely share their enthralling tales with you. While making way back to the beach, marvel at what makes this corner of the world so perfect. EXPLORE THE MALECON – While taking a leisurely stroll along the Puerto Vallarta’s Malecon, marvel at the many statues that line the famous boardwalk. Start at the north end of the wide sidewalk and embrace the large, unique bronze and stone statues from local and foreign artists as you walk along the way. It is wider so as to accommodate the growing number of visitors and provide room for the outdoor cafes, art, jewelry shops, and boutiques that are dotted along the Malecon for the pure entertainment of residents and tourists alike. You've not been to Puerto Vallarta if you haven't strolled along the Malecon, the heart and soul of this beautiful town. WATCH A PACIFIC SUNSET – Banderas Bay is composed of small coves, hidden bays, and beautiful beaches, making Puerto Vallarta one of Mexico’s best-known Pacific Coast destinations. The quiet and secluded beach of Las Caletas is perfect for kid’s to adventure for they can try their hand at zip lines, Tarzan swings, climbing nets, and more! To get away from the crowds and to escape reality, the beaches are the perfect place to be. Kids and families can enjoy a more relaxed atmosphere as well. The Pacific Coast sunsets are epic and shouldn’t be missed while overlooking the water, no matter what beach you visit in Mexico. EMBRACE THE CULTURE – While walking through the cobbled streets of old town, step into the church of Our Lady of Guadalupe – the renowned landmark crown and the top icon in the city. While offering prayers, pay an ear to the sweet sounds of the mariachi bands that play often at meals and celebrations. Dine on freshly caught fish tacos, with delicious guacamole. Learn the local language from the locals. Immerse yourself in Puerta Vallarta and enjoy your Mexican vacation with a slice of authentic cultural encounters. For no visit to any destination remains complete till you have known it locally. Puerto Vallarta is a city that is full of things to see and do that are sure to fit any budget. So here you go! 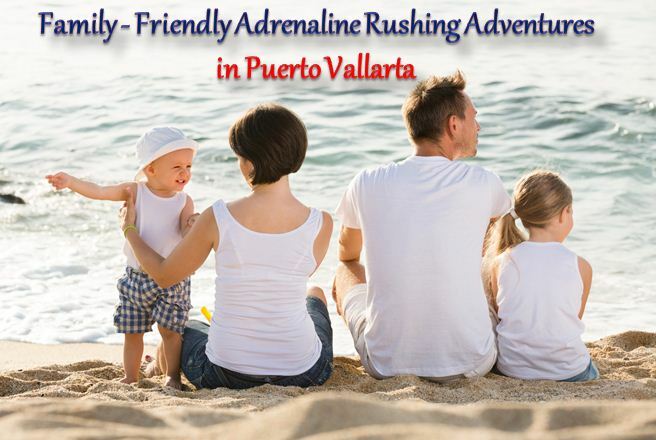 There are no excuses not to come and enjoy an incredible time during your Puerto Vallarta yacht tours with your family.